Elaine and I have just celebrated our 1 year anniversary of our marriage on August 2nd, 2014. We met on cMatch on September 23rd, 2012. After all of the dating websites I was beginning to think that this was a waste of time because most of these dating websites are full of scam artists. I took a recommendation of a friend to check out cMatch so came in expecting nothing. I saw an interesting profile and winked on her page after reading her profile, to which she responded back, so soon we exchanged private emails and starting emailing her from Africa. She was in Sri Lanka so yes it was long distance. We actually had mutual friends who knew each other so she could verify I was an honest guy. 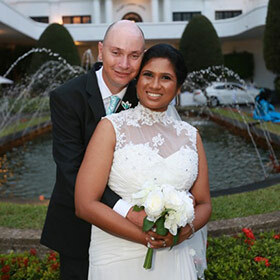 Then we started skyping and I visited her twice in Sri Lanka and the second time which was December 2013 I came over and proposed to Elaine. We got married on August 2nd, 2014. I am still skeptical of online dating sites, but cMatch proved that you can find true love online.